Just as you can't judge a book by its cover, you can't judge an entrepreneur by his/her desk. Or can you? Standing desk, traditional wood-trimmed table, lap-desk, or a makeshift corner of a dining table, the desk is an entrepreneur's kingdom. Key characteristics of the desk can tell a lot about the type of entrepreneur and the type of work being done. A meticulously clean desk may indicate a a deeply-entrenched entrepreneur, and perhaps someone who must think logically about their business. A cluttered desk may indicate more creativity and divergent thinking. Here are some more details about the nuances between clean and messy desks. 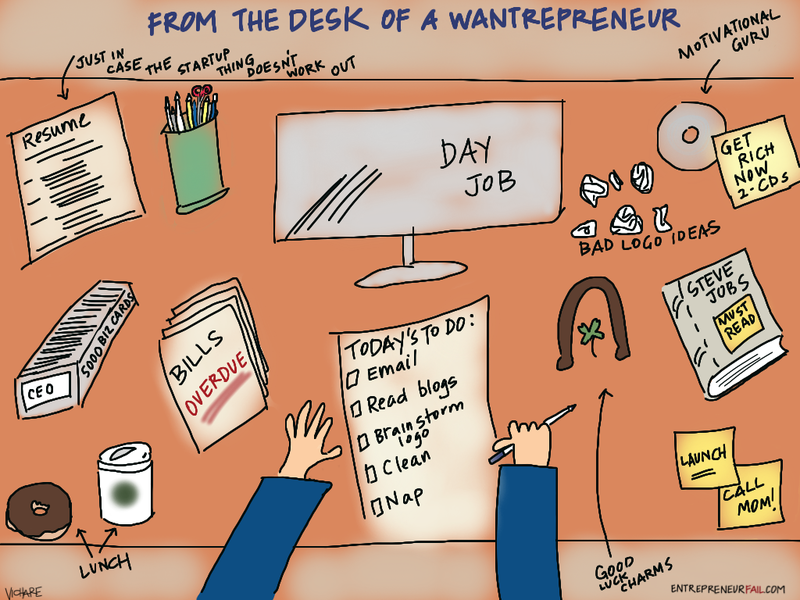 Other work - the wantrepreneur probably has a day job or is keeping his/her options open. A resume, a "day job" laptop, and the job postings section may be tell-tale signs. Motivational propaganda - many entrepreneurs have a guru or a mentor, but only wantrepreneurs surround themselves with the books, audio, video they think will make them then entrepreneur they want to be. To do lists - the wantrepreneur will add in unnecessary non-business related items just to make the to do list seem longer - e.g. doing the laundry, going to the bathroom, etc. So what type of desk do you have? And is there room for improvement? Let us know in the comments below. Hilarious! How do you come up with this stuff, Kriti. I love the resume and the good luck charms. Ha. So on point but with a humorous perspective. Love how the entrepreneurial spirit is captured! !